In my last post, I mentioned that we would be using the Sheltering Tree Stamp Set from the Stampin’ Up! 2015 Occasions Catalog and the Scallop Tag Topper Punch for this month’s club card. Well, it has been a busy month for me and by Friday night I still hadn’t gotten my act together for club on Saturday. I needed some inspiration! Once I saw the sketch challenge from Freshly Made Sketches – “EUREKA!” I knew that was it. Try as I might, I was unable to incorporate the Scallop Tag Topper Punch into the sketch. (Never fear, it will return because you know I love cards with tags!!) Now, back to business. The Sheltered Tree stamp set I am using is a photopolymer set which allowed for some “reverse image” stamping. What is “reverse image” stamping you say? Well, just that – reverse the image! Adhere the detailed image side of the stamp to the clear block and ink the flat side, or the reverse side of the stamp, which created this wonderfully full-blooming tree effect (affectionately nicknamed the blob effect at club). I used 2013-15 In Color Pistachio Pudding (really going to hate to see this color retire in June!) for the full bloom effect. 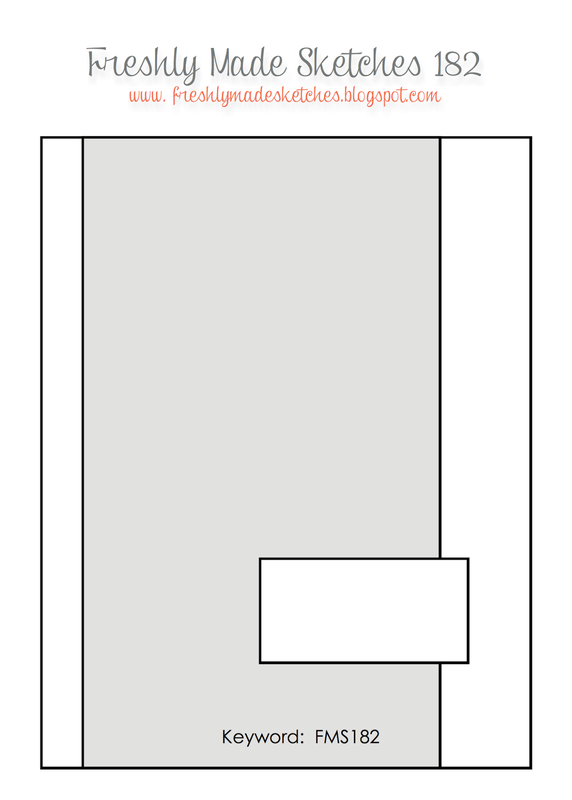 Clean the stamp and adhere the flat side of the image to a clear block and ink the intended leaf image in Old Olive. Line it up with the “blob” and stamp. Turned out nicely. The color for the tree trunk is 2013-15 In Color Baked Brown Sugar (pause for sadness to fade again). The tree swing and bicycle is stamped in Early Espresso. The bicycle frame is stamped in Night of Navy. 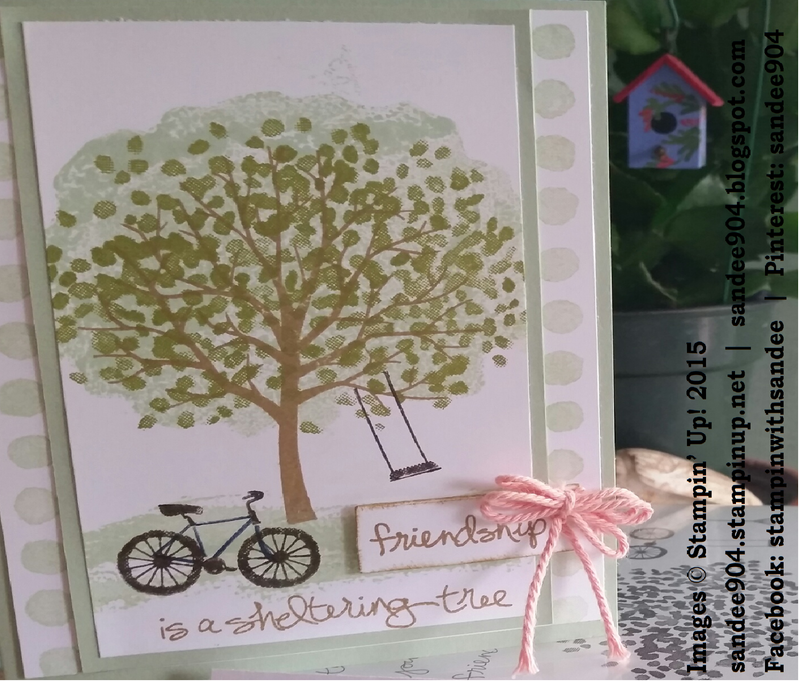 I decided to use the stamp set’s signature sentiment, “Friendship is a sheltering tree.” I love the sentiment, and really love the font! To keep to the design of the sketch challenge, I masked the sentiment and inked in Baked Brown Sugar the word “friendship.” Although it is hard to see, the word is cut out using the smallest banner die cut, some quick sponging of Baked Brown Sugar around the edges, and affixed to the right side of the card just below the swing. The bow is created with 3 loops using the Crisp Cantaloupe Thick Baker’s Twine. In this picture it hides the “flag” portion of the banner. Reversing the banner so that the flag pointed left instead of right would be a better choice. To finish the card, I layered on slightly larger Pistachio Pudding card stock, layered again on Whisper White card stock (trimmed with a row of circles from the Painted Petals stamp set — my favorite Stampin’ Up! stamp set), and adhered to a Pistachio Pudding card stock base of 51/2 x 4 1/4. If you would like specific dimensions and instructions to create your own card, please e-mail me and I will be happy to share them with you. And if you don’t already have a Stampin’ Up! demonstrator, it would be my honor if you selected me to help you in your future creations!